Matthew 15:13 (KJV); But he answered and said, Every plant, which my heavenly Father hath not planted, shall be rooted up. If a man is not planted by God, he will be up rooted. Understand this; merely because someone is going up(succeeding in life) does not mean that they are going up the right way. There are several people who have succeeded purely out of wickedness. For these, it is simply a matter of time, their leaves will wither and their fruit will become corrupted. 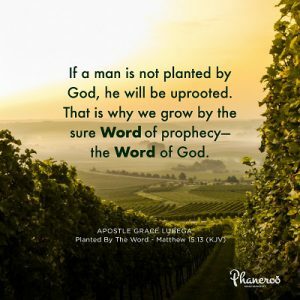 That is why we grow by the sure word of prophecy—the Word of God (2 Peter 1:19). The Greek word used for the word sure is “bebaios” which is also translated to mean, stable and firm. The WORD of God establishes you so firmly that nothing can uproot you. Heaven and earth shall pass away but His WORD shall not pass away! (Matthew 24:35). This WORD in you and by which you grow is eternal because it lives and abides forever! (1 Peter 1:23). When He says you are the head and not the tail, it is settled. When He says you are His righteousness, it is settled. When He says by His stripes you were healed, it is settled. Nothing in the world can change that course because you are planted by the eternal substance of the WORD of God. Hallelujah! PRAYER: Father, I am thankful for this knowledge. Today, I stand on your Word—it is steadfast, sure and my very firm foundation. I grow by the Word and live life by its patterns. I am planted by you and nothing can change the course of my destiny. Because I live by the Word, I will surely finish well. In Jesus’ name. Amen. And I shall NOT BE MOVED…I’m like a tree planted by the waters..Thank you Apostle Grace.